When our kids were young and living at home, it was sometimes a challenge to get them out of bed for school. My solution was to go into their rooms singing “rise and shine and give God the glory, glory children of the Lord.” Yes, it was as irritating as it sounds! I’m pretty sure my kids – who are all adults now – still hate that song! Even in our desire to know God, early rising has value. The Psalmist said “…early will I seek thee.” (Psalm 63:1 KJV) The New International Version says, “earnestly I seek you…” The words “early” and “earnestly” come from a Hebrew word that means “to break forth” like “the breaking of the dawn”. A secondary meaning is “to break in” like prying a door open to “seek” what’s inside. In either case, there is a search going on that takes priority- hence the idea in one translation that we seek God early, and in the other we seek God earnestly. In both cases, He is our number one priority -so both translations are correct and actually teach the same thing- we want God first -so we seek Him early and earnestly. From a practical standpoint seeking God early makes the most sense. Jesus got up “while it was still dark” to seek God in prayer (Mark 1:35). There are, generally, fewer demands on us early in the morning. Even if we get up only 15 minutes earlier then usual, to give God our first thoughts in the morning, I believe our day will be better for it. God has a plan for your day. Spend time with Him early and discover the power of His daily guidance. The principle reason for starting early is true in other areas of life too. For instance, in sports you wouldn’t want to get the game plan from the coach after the game – you would want it before the game. Why then, in the more important arena of life itself, would we not seek direction from God as early as possible each day? Of course we can pray at all hours of the day and night and we are encouraged to do so (1 Thessalonians 5:17). It has been my experience, however, that the longer I wait before seeking God in prayer the harder it is to do it. My day gets busy, my mind gets distracted, and my time is often not my own. Many others have learned the same lessons in the school of prayer. So, start early seeking God and enjoy the benefits all day long. Get up and give your day to God. Ronnie Floyd, Daniel Henderson, Bill Elliff, Steve Gaines, Bill Bright, Al Mohler, and many others. The three books I’ve chosen for this list are easy to read, perfect for getting your prayer life started, or for starting over. So, here’s a brief idea what each book is about and why you should read it. For many years, when the low cost paperback edition was available, I led the Churches I’ve served to give away hundreds – maybe thousands – of copies of this book. I have recommended it to everyone I know. I once wrote the author and jokingly told him I had singlehandedly made his book a best seller! He wrote me back an encouraging note. This book divides an hour into 12 segments of 5 minutes each. It shows the reader how to incorporate the different aspects of prayer, like praise, confession, intercession, and eight other categories (praise is listed twice), into our daily communion with God. The book is full of inspirational quotes and uses enthusiastic, simple language to motivate us to pray more regularly and confidently. It is, for all of its rich content, a short book too, so it won’t take you long to read it. There are 3 things I like about this book. For one thing it is written in a positive, sometimes humorous, common sense way, using everyday language. You don’t need a big theological vocabulary to read this book. Secondly, the book uses numerous examples and stories, excellent quotes, and Greg Laurie’s own life experiences to help us overcome one of our biggest challenges in prayer- we get discouraged and tend to give up too quickly. Finally, the book is short. It’s a quick read and you can start benefiting from it right away. This book is one of the most influential books I’ve ever read. The story of how God transformed a struggling congregation of about 25 people into one of the leading churches of our time is pure gold! In one sense it’s more than a book about “how to pray.” In fact, it’s not that at all. Yet, in order to grasp in a contemporary context what is possible when people pray, this is “must reading”. The first chapter hooked me and I couldn’t put it down. The entire book is loaded with personal stories of contemporary people who received incredible answers to prayer and transformed lives as a result of prayer. I urge everyone to read this book and I beg every member of my church to read it. If you’re a pastor you have to read this book! prayer that can revolutionize your prayer life! We have a special “guest blog” from a mental health professional who has a heart for God and a heart for people. Hyde Park Baptist Church is blessed to have an incredibly gifted team of professional Christian Counselors at the Hyde Park Counseling Center. The capable Director of the Counseling ministry is Dr. Nicole Fitzpatrick. Since I preached recently on Elijah’s depression, I asked Dr. Fitzpatrick to write this article to help those who struggle with mental health concerns. Having the privilege of walking with people through mental health challenges over the course of the last 20 years, it is evident that one of the hardest and most elusive issues that people face is depression. Depression is often misunderstood, and left undiagnosed and untreated has the potential to lead to fatal outcomes. You or your loved one(s) don’t have to feel this way. There is hope and there is help. • Major depressive disorder is more prevalent in women than in men according to the American Psychological Association. • According to the NIMH, the prevalence of adults with a major depressive episode was highest among individuals aged 18-25 (10.9%). Bottom line, depression is real, it hurts, it feels like no one gets it, no one is around, no one hurts as much as you, at times you can even question where is God. You may stop caring, stop sharing, turn inward to your thoughts and feelings rather than upward to God or share with others the depths of your pain. It is often a silent struggle that feels so dark and desperate. Depression like other mental illness isn’t always something that others can see, it is something that implicates your brain chemistry and can impact your physical health, emotional well-being, and your spiritual life as well. Your thoughts and feelings can become so overwhelming that you can’t even get out of bed in the morning or go through your day as you once did. Everything feels heavy, hard and overwhelming. This is depression. 4. Insomnia or hypersomnia nearly every day. 5. Feeling slower or more keyed up in your body nearly every day (observable by others, not merely feelings of restlessness or being slowed down). 7. Feelings of worthlessness or excessive or inappropriate guilt (which may be delusional) nearly every day (not merely self-reproach or guilt about being sick). 8. Diminished ability to think or concentrate, or indecisiveness, nearly every day (either by subjective account or as observed by others). These symptoms cause clinically significant distress or impairment in social, occupational, or other important areas of functioning. It may be noted that something is “off” or “different” or I am not “feeling like myself” these are all important concerns to take note of. and work to understand and collect more information around the symptoms of the underlying problem. I think I am experiencing a depression? What now? What next? First, it is crucial to acknowledge that you may be suffering with depression. Awareness of the problem is key to getting help and later walking in renewal. Research has shown that talking about your problems is integral to moving into freedom over your feelings. Having sad or difficult times is normal partof our human experience, it is what we do with those feelings that makes all the difference. Acknowledging your feelings and talking about them with a professional can lead to transformation in your life. At times, medication therapy may also be a tool to help boost neurotransmitter functioning so your brain gets back to optimal functioning in a balanced state. Diet and exercise are other important keys to fighting depression. Remembering your own self-care and prioritizing it is integral to your wellness plan. Interestingly, waiting to feel better or wondering when the depression is “going to go away” can create a lot of secondary anxiety and fear. Depression and anxiety often go hand in hand. It is important to extend grace to yourself and surrender your timeline for feeling better so that you can allow your mind and body to heal. The key to living well with depression is to acknowledge it and then get the help you need. Bottom line, if you need help get help and if you are wondering if you need help, get help too. You don’t have to face depression or any other mental health struggle alone. We can see biblical examples of those that struggled with situational depression as well as what would now be diagnosed as clinical depression as well. It is normal to ask the Lord why and how long? Many in Scripture did just that and we can learn from the Word for ways to ask and receive, seek and find, knock and the door will be opened. The important thing is that we do not falter from knowing God’s character and that He is with us, He will never leave for forsake us, and He has a plan. Often times, our feelings can cloud our perception of God and the timeline seems longer than we would like or ever want to endure when we are going through emotional pain. The key to weathering the emotional storms that come into our lives is to remember who we are in Christ. Renewing your mind through the Word of God is instrumental to making and maintaining holy and healthy changes in your thought life. It will take time but the restoration of the soul will happen. When you are coming out of a depression, gradual, slow change is typical. This will lead to lasting change that brings us out of the darkness and into the light. Being encouraged by other believers is another way to walk through the difficult time, bearing one another’s burdens and encouraging each other during the hard times. Remember you are already victorious in the Spirit over depression and any other emotional battle you may face, claim this by faith first and the feelings will begin to follow. Reciting affirming one who you are in Christ, claiming the victory you have in Him and remembering God’s promises for you as a believer as well as God’s faithfulness throughout the generations is integral to walk by faith through this or any other difficult time. I often tell my clients we must believe this by faith first, feelings follow. Verses such as in my weakness, He is strong, and knowing that faith is believing not in that which is seen but the unseen are particularly salient and important truths to remember even when it hurts. The Helper and the Healer allow us to trust God even when we walk through the valley of the shadow of death to experience God’s promises in a way that we could never have experienced had we not gone through this dark time. Knowing that there is a purpose for suffering and a plan and that you are more than a conqueror in Christ especially when it hurts is the key to experiencing victory over depression and any other battle for the believer. Today, at the age of 99, Billy Graham, the world’s most well known traveling preacher, went home. I wept when I heard the news. His impressive and storied life, which spanned nearly a century, is now being remembered and retold everywhere. Regardless of how hard we may try, however, we will not easily or soon come to terms with how epic, improbable, and historic his life became, or readily comprehend how deeply it was been imprinted upon our times. Even Billy Graham himself couldn’t explain his uniquely unparalleled journey. Life for history’s most famous evangelist began on a large dairy farm near Charlotte, North Carolina on November 7, 1918. But he was not destined to be a dairy farmer for long. When Billy Graham was a teenager, the evangelist, Mordecai Ham, well known for a heavy handed, theatrical preaching style, was conducting a “tent revival” near Graham’s home. The tent revival had been organized by a group of local business men. The men had regularly met for prayer on Frank Graham’s dairy farm, and they became convinced an area wide revival was needed for the good of the community. Ham was nothing like the ministers in the area. He was a sensationalist who condemned local pastors, preached fiery sermons against alcohol, and accused local high school students of rampant sexual misconduct. The more outrageous his accusations became, and the more people talked about it, the more people went to hear his sermons; which were comprised of an odd mix of old style Christian fundamentalism, partisan politics, and ugly, unfortunate, unnecessary rants against Catholics and Jews. Young Billy Graham, raised attending the small and proper Associate Reformed Presbyterian Church, thought it was all “hogwash” and refused to attend. When one of Graham’s friends, who had been attending the Ham tent revival, became concerned Graham was not a true Christian, he convinced “Billy Frank” (as he was known then), to attend the meetings by allowing the teenager to drive the friend’s truck to the tent. The opportunity to drive was too powerful an invitation to pass up for the farm-raised, sheltered 15 year old boy. 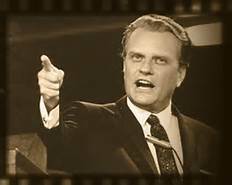 Once there, Billy Graham was, by his own admission, “spellbound” and returned night after night with a growing sense of spiritual conviction about his own sins and the death of Christ on the cross as payment for those sins. Finally, one night, he could refuse Christ no longer. Billy Graham responded to the invitation to walk down the sawdust covered aisle and gave his young life to Christ. Within a few years from that night, Billy Graham had also become an evangelist. He took a much different approach than Mordecai Ham, however, who had seemed to revel in condemning local ministers, the congregations, and other religious groups. Instead, Billy Graham developed a much more inclusive approach when working with Christians outside his own fundamentalist background. His intentional strategy of uniting multiple denominations around the common cause of evangelism led, in part, to the formation and success of the sweeping evangelical movement of the second half of the twentieth century. But one thing from the tent revivals of his youth never changed-he continued to offer people the same unapologetic, public invitation to receive Christ. Billy Graham’s ministry would not be confined to revival tents and “sawdust floors” in the rural south. His preaching, instead, would eventually pack the largest auditoriums, stadiums, and venues in the world. Billy Graham would go on to speak face to face with approximately 215 million people in 185 countries and territories. Beyond the live Crusades, Dr. Graham’s ministry and outreach included radio, television, movies, best selling books, magazines, and the internet. According to the Graham organization, more than 3 million people around the world have responded to the invitation, offered by Billy Graham, to receive Christ. Through all venues combined, he preached to more than 2 billion people, more than anyone who has ever lived. In the early days, as his influence grew, he was befriended by powerful national leaders, including every US President since Harry Truman. It has been reported he was influential in the conversions of both Dwight D. Eisenhower and George W. Bush. The annual Gallup Poll of the “10 Most Admired Men in the World” called Billy Graham the “dominant figure” of the poll since 1948, appearing on the list an unprecedented 60 times and 56 consecutive times by 2017, more than any other person ever. “I FEEL ALMOST TOTALLY ALONE. The vast size of his ministry is almost incomprehensible at times. For example, once in South Korea, he preached to a crowd of 1 million people – the largest congregation ever assembled to hear an evangelical sermon. His New York Crusade in Central Park, his largest attended event in North America, drew an estimated 250,000 people for one service. Yet, Graham himself remained surprisingly humble about the successes and achievements others so justifiably admired. Years ago, for example, when asked about the feeling of preaching to such enormous crowds, Dr. Graham responded with his typical self deprecating manner. “It’s almost as if I’m not even aware of the thousands and thousands of people out there. I’m preaching just to the six inches in front of my face. I feel almost totally alone. And even if nobody responded, if no one came, I would still preach.“ Of course, because of his sense of divine calling, like others before and after, it’s believable that he would have continued to preach regardless of the response, but people did come. They came by the millions to hear the self described “farm boy” from North Carolina. And over the decades, his message was essentially unaltered from those first days as a teenage preacher in the rural south. Eventually, Billy Graham came to possess a global presence, and a respect unmatched by nearly any other preacher in history. An overview of his life might understandably focus exclusively on his evangelistic preaching and the Crusades, but there was much more to the story. In addition to his preaching ministry, Billy Graham, along with the evangelical theologian Carl F. H. Henry, was instrumental in launching Christianity Today Magazine. In addition, together with international Christian leaders like John R. W. Stott and others, the Graham ministry also conducted historic Global Conferences on Evangelism, like the Lausanne Conference in Switzerland, to train itinerant evangelists around the world and advance the mission of the church. His influence in the United States after World War II clearly went beyond his distinctive preaching ministry. He also pioneered evangelistic outreaches through the use of multiple forms of media, including his weekly radio program, The Hour of Decision. He frequently appeared on nationally broadcast television specials, and produced movies through his World Wide Pictures. More nuanced, but equally significant, was his deliberate collaboration with evangelical theologians like Frank Gaebalien, Harold J. Ockenga, Carl Henry, J. Edwin Orr, and others, who, along with Graham, laid the groundwork for evangelicalism’s prominent role in the American experience in the late 20th century and beyond. Billy Graham will no doubt be remembered, appropriately, as one of the greatest men who ever lived. Christian history will accurately record that only a handful of leaders ever loomed so large over their times as did Billy Graham. Through the decades, and in spite of unprecedented changes in the world around him over the last 70 plus years, he persisted faithfully with one purpose in life- to tell the story of Jesus, especially His death for sinners on the cross. It was the message of salvation he heard more than 80 years ago in a tent revival. And it was the message he preached around the world. It’s hard to imagine that in our lifetimes we will ever see a man so gifted and accomplished, and yet so refreshingly uncomplicated again. Today, Billy Graham died and Christians around the world are feeling the loss. He leaves behind a legacy of faithfulness and integrity that will be reviewed and remembered for as long as people study the Christian faith, and the leaders who have shaped it. He was greatly loved by the Christian community and far beyond. Throughout Scripture, God’s people interceded for others. In an extreme example, think of how Abraham prayed for those in Sodom to be spared. (Genesis 18) The consistent display of God’s power when we pray, assures us that prayer on behalf of others can have incredible results. Intercession finds an audience with God. S.D. Gordon, an early 20th century author and pastor, compared the service/ministry of prayer to other ministries in the Body of Christ and concluded, “In all other service we are constantly limited by space, bodily strength, equipment, material obstacles, and difficulties in the peculiar difference of personality. Prayer knows no such limitations.” Prayer knows no limits since nothing lies outside the reach of prayer except that which lies outside the will of God! 🔷 ONLY ONE MORE DAY TO COMPLETE OUR READING OF THE ENTIRE NEW TESTAMENT IN 31 DAYS! ministry was coming to an end, but his private intercessory prayer ministry lived on. Yours can too! What if our greatest contribution in the Kingdom occurred in our secret place of prayer? It could happen, since prayers last forever. 🔷 WE HAVE ALMOST COMPLETED THE ENTIRE NEW TESTAMENT! No matter where you are in your reading schedule, DON’T QUIT UNTIL YOU REACH YOUR GOAL! WELCOME TO THE BOOK OF ACTS!